Bits or pieces? : From purpose to leadership and back again. From purpose to leadership and back again. I haven't written in a while, so I thought I'd put down same rough notes on managing an environment. Contrary to popular belief, management isn't some linear game of planning but a highly iterative cycle. 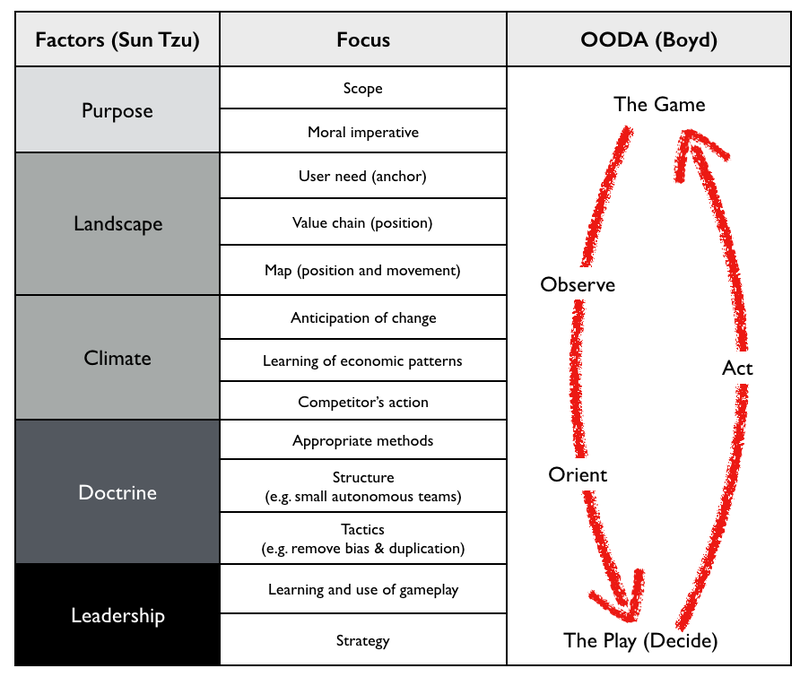 It's best described (in my opinion) in the following diagram by combining Sun Tzu with John Boyd. 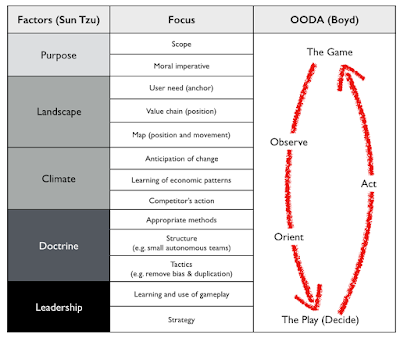 Figure 1- Tzu and Boyd. The first part is to understand your purpose i.e. your scope and your moral imperative (the reason why others follow you). Your organisation consists of value chains but it operates in the value chains of others. So you need to understand what you are and who you interact with. This is the game that you are playing in for the time being. Please note that the process is iterative i.e. your leadership and action may well change the game you are playing in. There is no such thing as core to a company, it's all transient i.e. Nokia's purpose changed from when it was a paper mill to when it became a telecommunications provider. You are, in the words of Deng Xiaoping, "crossing the river by feeling the stones" or in other words, the best you can do is to have a direction and be adaptive. Now, once you have a scope you need to understand your landscape. This is what we call situational awareness and it requires a map. To create a map you need several things. First you need an anchor (e.g. in chess it's the board, in a physical map it's the compass). Then you need the position of pieces relative to the anchor (i.e. the co-ordinates on a chess board for the queen or this unit is NW of this position in a map). Finally you need movement i.e. where the pieces have been and where they can go. 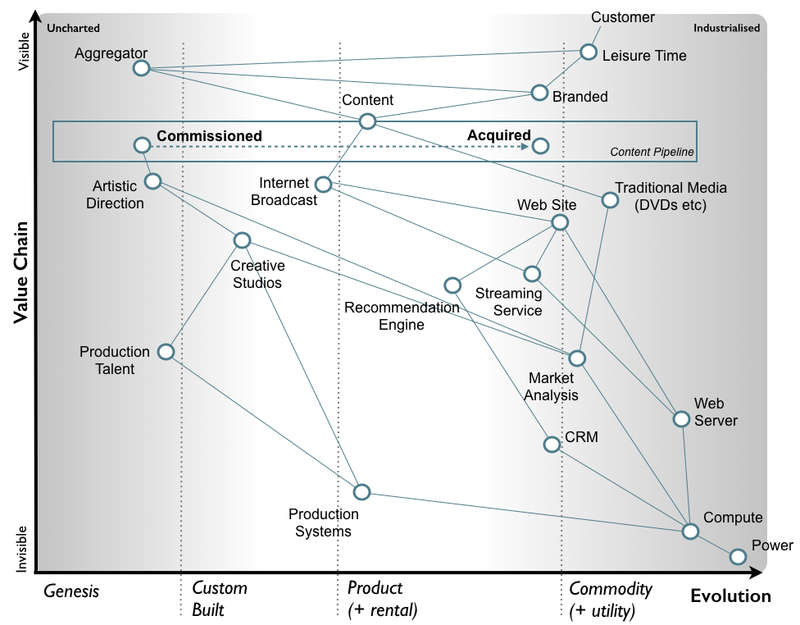 To do this in business, you can use a Wardley map. The anchor is user needs. Relative position is given in a chain of needs anchored on the user. Movement is provided by evolution. Be careful here, I often see utter howlers with people using diffusion as a replacement for evolution. They are not the same thing. An example map is given in figure 2. Figure 2 - An example map. There's a lot of things which call themselves maps but without position and movement, they're not a great deal of use for learning. There's another concept worth noting called flow i.e. flow between components (whether information, risk or money) but that's a little bit advanced for this post. It's also one that people regularly make a hash of by making ineffective flows more efficient. One you have a map, you need to understand the climate. Fortunately from the use of maps or boards, you can infer the rules of the game over time. 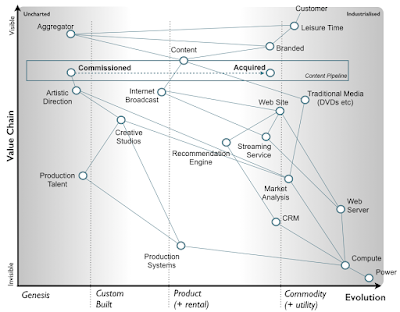 You can do the same with Wardley maps. There are many rules in the business climate. For reasons of brevity, I'll just mention 13 of the simplest. 1. Everything evolves : due to supply and demand competition. 2. Characteristics change : from the uncharted through transitional to the industrialised space. 3. No one size fits all : whether project management (agile vs lean vs six sigma) to purchasing to outsourcing. 4. Efficiency enables innovation : it's faster to build new things with pre-existing components than to start with everything from scratch. 5. Increased stability increases agility : an effect from componentisation. 6. Higher order systems create new sources of wealth : e.g. standard electricity enables TV. 7. Capital flows to new areas of value : either the more commoditised form or moves up to the higher order systems. This is a key part of creative destruction. 8. No choice over evolution : the Red Queen effect. 10. Success breeds inertia : There are in fact at least 16 different forms of inertia each with their own tactical plays to resolve. 11. Co-evolution : e.g. practice with activity, see DevOps. 12. Inertia kills : e.g. Blockbuster, Kodak. Neither of these companies were taken out by lack of innovation (they both out innovated the market). It was there pre-existing business models that hit them. 13. Disruption comes in multiple forms : there are many different forms but the two worth knowing about are predictable and non-predictable. Once you understand the basic rules of climate (i.e. the rules of the game) including the various forms of cycles (e.g. peace, war and wonder) then you can do a pretty reasonable job of anticipation by using the map. But you need to know how to organise yourself around the map. Here we're into context free doctrine. By this I mean doctrine that applies in almost all situations regardless of the context (i.e. the environment). There are many of these but again for brevity I'll just mention seven. 1. Focus on user needs : start with transaction and then onto customer journeys. It's essential to focus on the user need and you won't be able to map without it. 2. Use appropriate methods : i.e. use agile or six sigma where appropriate. 3. Remove bias and duplication : you can use multiple maps to do this fairly easily. 4. Fast, Inexpensive, Simple and Tiny : go read up on Lt Col Dan Ward and FIST. 5. Use small autonomous teams : e.g. cell based structures, think Two Pizza (AMZN) or Haier. 6. Think aptitude and attitude : e.g. pioneer, settler and town planner. This is still an area we're learning about. 7. Eat your own dog food : i.e. don't sell what you're not prepared to use yourself. At this point, when you're playing the game then you should have a good understanding of your purpose, your landscape, the climate and doctrine to be used. At which point we can add gameplay. Alas, there's a vast array of different forms of context specific gameplay that I'm now aware of. It's a bit like Chess or Military combat where there is all sorts of standard moves depending upon the context of the board or map. When playing the game you often use multiple at the same time. There are lots we could go through but I'll just mention one as an example in business - the use of fool's mate - which is to attack an underlying part of the value chain when you wish to shift a higher order part of the same value chain. The combination of the map and anticipation (from climate) gives you multiple points of attack (i.e. multiple wheres, see figure 3) and the use of context specific gameplay helps you determine why to attack this space over another. 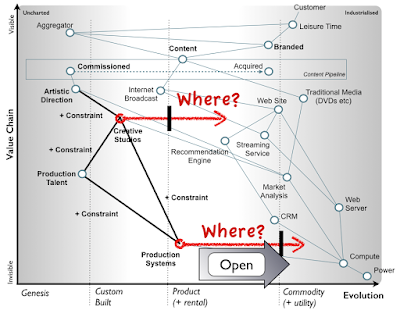 That's the key about strategy, the why is relative as in why here over there. You never start strategy with why, you always start with WHERE. Of course, this is the decision point and your action can impact the game, your purpose, the landscape and so on. It's all iterative. A constant cycle of observe, orientate, decide and act. Except in most business it isn't. Most business have no idea of the landscape they exist in. Hence they can't possibly hope to learn the rules of the game (i.e. the rules of economic climate). They certainly can't distinguish between context free doctrine and context specific gameplay nor do they have any mechanism for learning context specific gameplay. In most business, leadership is an exercise of writing down a purpose and jumping straight to strategy by copying what others are doing or gut feel or the use of verbal reasoning such as SWOT diagrams. It's a mess of memes normally. But then, that's not really surprising because if you can't visualise the environment in some form then how are you going to observe changes to it (you have nothing to compare to) and how can you orient around that? As figure 4 highlights, what could strategy be other than meme copying and gut feel? 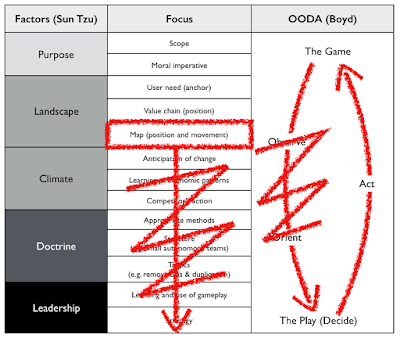 Is it really any wonder that corporate strategy documents tend to be a tyranny of action statements (how, what and when) with only the most vague notion of 'why' when we can't see where to attack or learn from our play? However, that doesn't mean people are daft or can't change, the problem is they've been playing a game of chess without ever seeing the board or understanding that a board exists. I see this all the time. I run a workshop in which I take groups of LEF members through a scenario (using SWOTs, reports and financial analysis) in which they choose a set of strategic options and then later on they map the same scenario and discover (almost uniformly) how utterly mistaken their first attempts are. It's amazing to see and especially those lightbulb moments when they realise how they've been playing the game in their existing business. As one CIO of an enormous environment (think in the billions) said to me recently - "once you've mapped, it becomes so obvious that you wonder why you weren't doing this before". 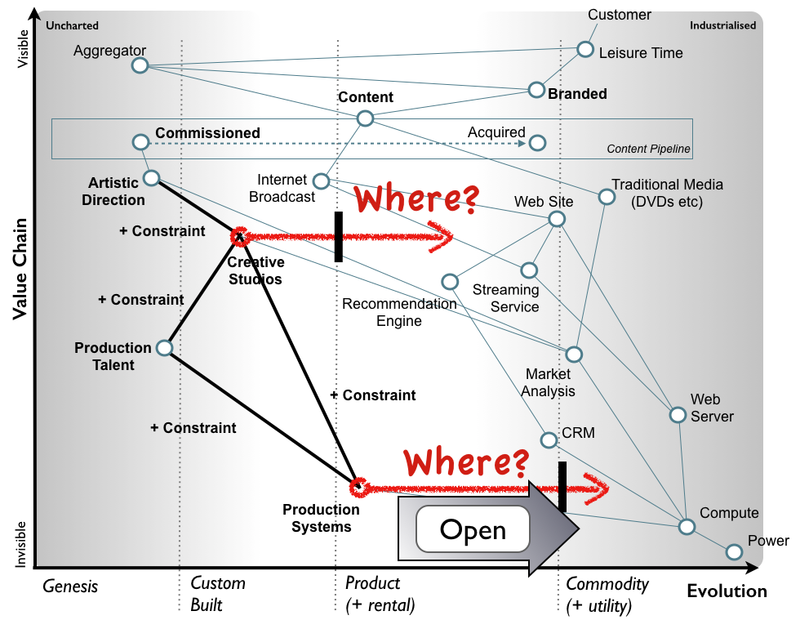 Of course, you can learn to map in a day and do remember that all of this is creative commons. When you get good you can normally map an environment, work out the gameplay and determine how to attack a given space within a day or so. The trick is getting good and that, like Chess, takes practice. Many years of it. However, that's down to you. The only people who can map an environment and play the game are the people who work / live in that environment. You can't hand this off to consultants. You have to put in the effort. Oh, but what about culture! That's another topic wrapped up heavily in doctrine with context specific elements and impacted by purpose and your choice of strategic play. However, given most people can't do the basics, I don't even think it's worth mentioning other than pointing out that you need more than one. But "culture eats strategy for breakfast" I hear some people cry. That's a soundbite which appears as popular as it is flawed. It has the accuracy of "the key to strategy is execution" or "you can't manage what you can't measure". But these are all more complex topics, better left to another day. Looking at Amazon and Lumberyard a bit more.